Concussion may cause severe long-term sequelae. The idea to learn more about this topic came up when Michael Wilde created a community on Google+ named ‘Concussion’. On a first look it seemed to be an unusual but quite interesting idea to build this community and so I joined it without any special knowledge. 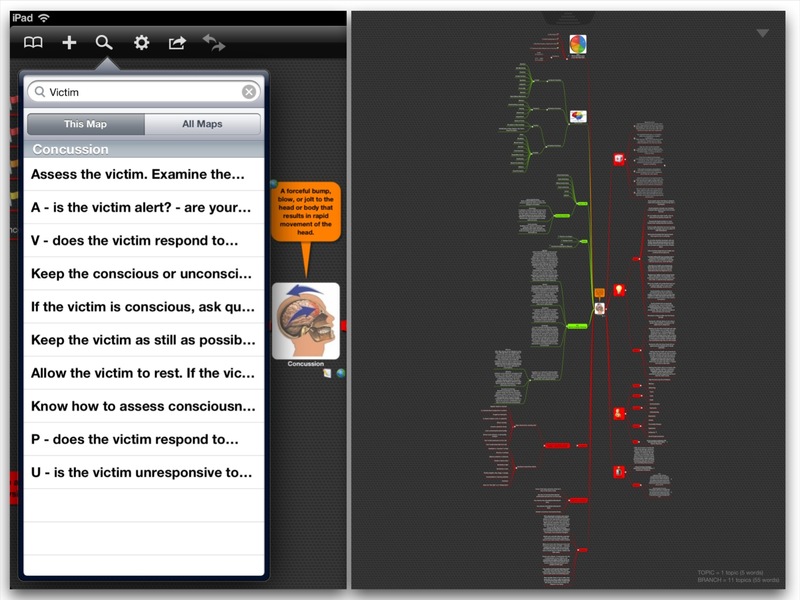 My idea was to get involved by using my mind mapping tool iThoughts on the iPad with it’s web research functionalities. 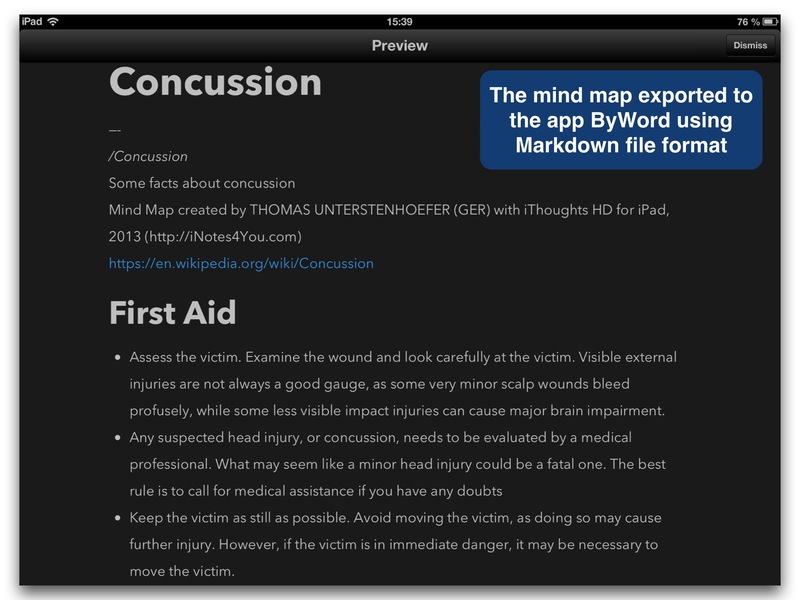 Here are some facts about this kind of injury, and, as this blog is about the usage of Apple’s iOS devices, the creation of an appropriate mind map visualizing the main topics. Our brain is what makes us a human being. So everyone gets frightened if the head receives an injury. Medics talk about TBI which means Traumatic Brain Injury and it’s seen as a highly complex matter. So if you want to visualize some information about TBI using a mind map you quickly are confronted with lots of topics and extensive content. The map rapidly turns into a bulky knowledge base. It looks similar to a swollen 2D-Brain. It would be easy to add some more MB to the map. The criterion to extend knowledge should be the qualification of the audience. In contrast to written text mind maps need much more space. If all the topics are being expanded even a large computer screen is worth than useless. So if it comes to share comprehensive information it’s inevitable to use a mind mapping tool with which topics can be expanded on demand while other topics stay collapsed. If there is no tool available the map has to be split into different images or PDFs showing single topics like in presentations with Apple’s Keynote or Microsoft’s Powerpoint. I’m no doctor so I cannot retrieve relevant facts about TBI from my brain. 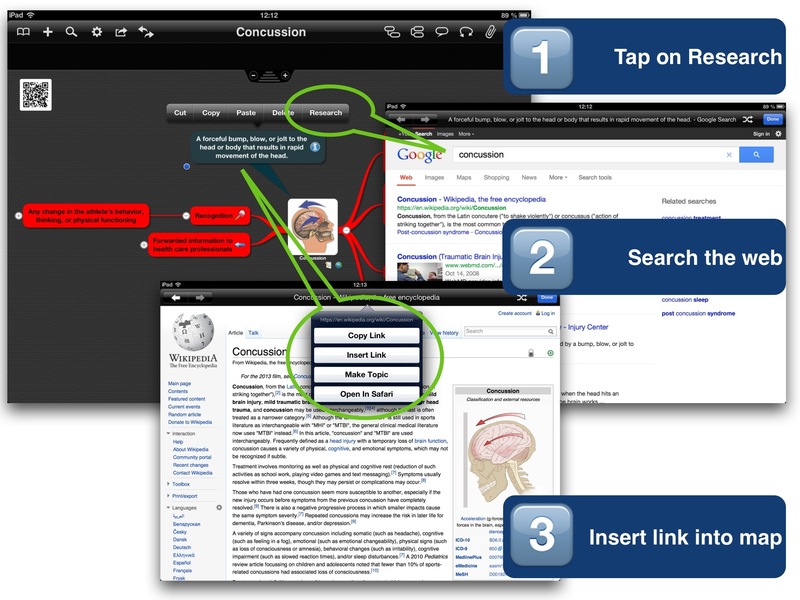 On an iPad with its one-window-display it can be a troublesome work to collect text and links by switching between two apps, the browser and the mind mapping tool. Craig Scott -the developer of iThoughts- was aware of these problems when developing his powerful app. Here is a brief description of the auxiliary functions. Added by a special iOS gesture with which app switching is much more easier than on an iPhone you can focus on a topic without being distracted by multiple windows and an uncountable number of controls like on a Windows PC. A bookmarklet is a small piece of program code installed in a browser as a bookmark to get access to special functionalities. Here is a description how to install the bookmarklet which forwards the actual web address to the app iThoughts and (re)opens the app. Using these functionalities makes it easy to create extensive and powerful mind maps summarizing all the relevant information about a topic. Brain injuries are most often caused by falls on the playground or in the home, motor vehicle crashes, or sports injuries. At least 5.3 million Americans, 2% of the U.S. population, currently live with disabilities resulting from TBI. Moderate and severe head injury (respectively) is associated with a 2.3 and 4.5 times increased risk of Alzheimer’s disease. Males are about two to three times more likely to sustain a TBI than females are. TBI hospitalization rates have increased from 79% per 100,000 in 2002 to 87.9% per 100,000 in 2003. Veterans’ advocates believe that between 10 and 20% of Iraq veterans, or 150,000 and 300,000 service members have some level of TBI. 30% of soldiers admitted to Walter Reed Army Medical Center have been diagnosed as having had a TBI. This information completed with some more topics like ‘First Aid’, ‘Effects’, ‘Prevention’ etc. 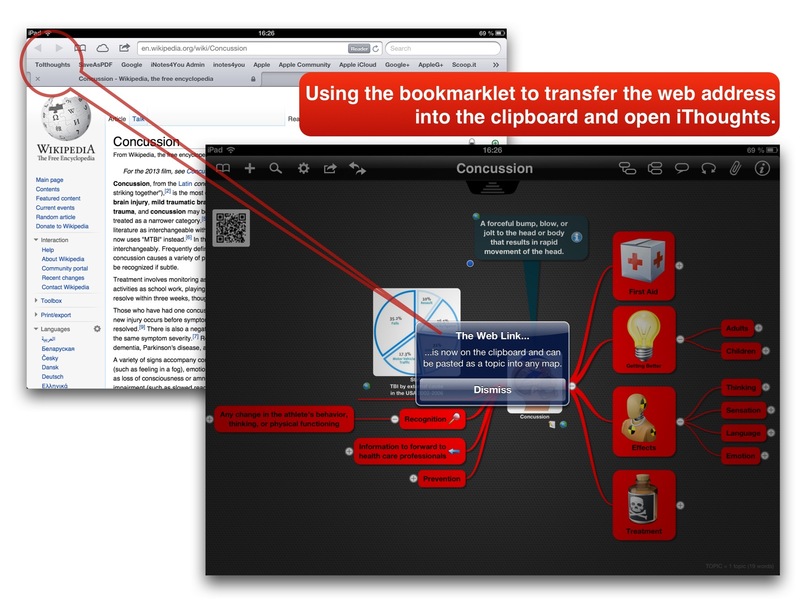 already clarifies that a mind map with expanded topics cannot be displayed on an iPad or a computer screen without frequent moving in all directions as well as zooming in and out to show the details (see the image below showing the expanded map). However, I tried to create a map containing understandable information even for people who are not involved in this topic. That means, most of the topics are explained by textual descriptions to avoid frequent use of links to websites where information is usually too extensive to make adequate use of it. It’s an easier approach to the subject when having the most relevant information on just one screen. Here is the result of the creation process. Without some makeover it took me about 2 hours to find relevant information and create the map. These file formats have been created by iThoughts HD for the iPad (.ITMZ file format). Compatibility to other tools is limited. 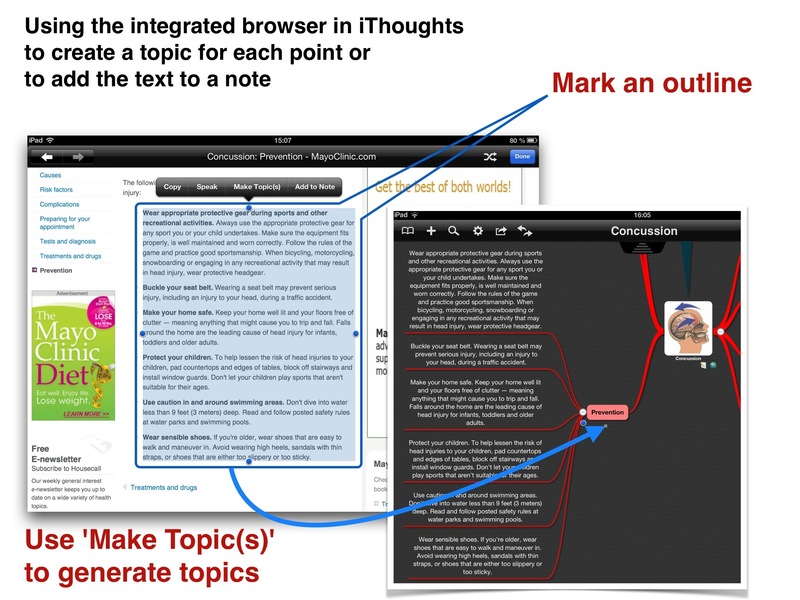 iThoughts provides a Search functionality as well as the possibility to split large maps by selected topics. iThoughts offers a lot of file formats which makes sharing easy. These file formats can easily be imported into Apple’s presentation app Keynote. To see how some features of a mind map work on an iPad I made a video with the app DispRecorder (Smart Baby) and transferred it to iMovie (Apple) to do some makeover like adding slides and music and then uploaded it to YouTube. Neither Mr. Coppala nor Mr. Spielberg helped me to produce this little piece of artwork. So please be sympathetic when rating this video. This mind map is definitely not in accordance to the general accepted rules of mind mapping where a topic in most cases contains just one significant word. However it summarizes information about a complex theme on an 9.5″ x 7.3″ (241mm x 186mm) device. That’s less than a single sheet of paper! The creation process can be done within two hours. 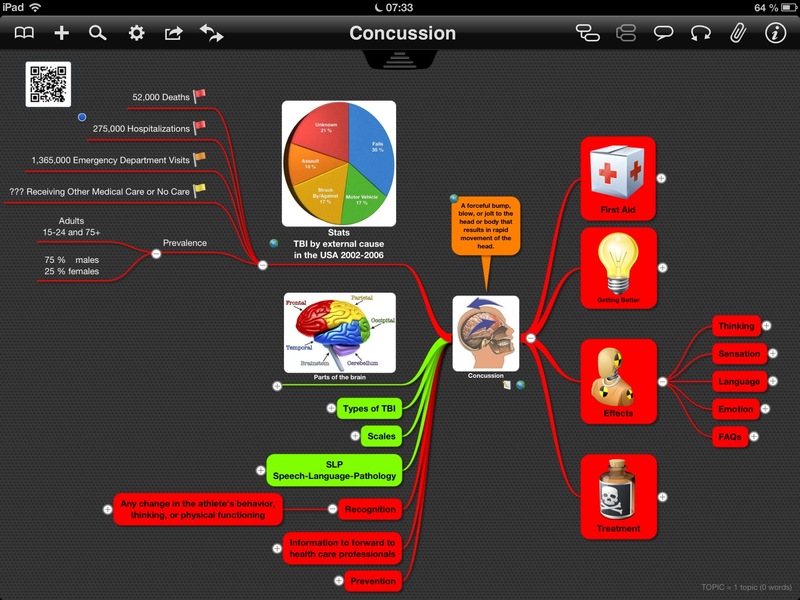 If you connect the iPad to a TV or a beamer via Apple’s Digital AV Adapter the mind map can be used for a lecture on TBI (if the map would have been created by a professional and not by myself). Don’t hesitate to ask questions in the comment section or via my contact form on the About site.